This quiz covers all aspects of Graphing a SOE. -Determine whether the following systems have one solution, no solution, or infinitely many solutions. Must also have to solve for y in some problems. 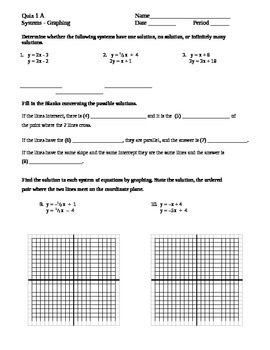 -Find the solution to each system of equations by graphing. State the solution. -Given an ordered pair see if it is a solution to a given system.